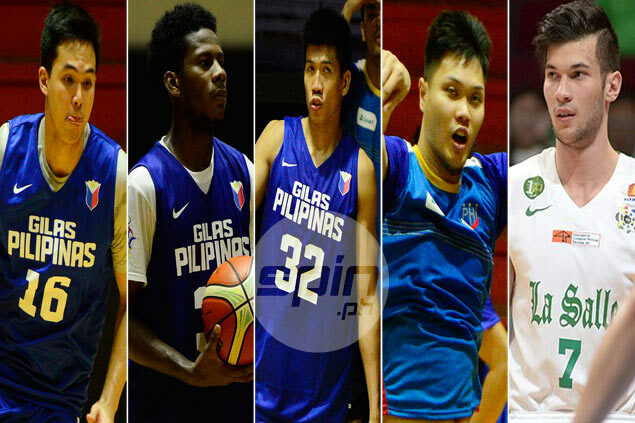 ED Daquioag, Chris Javier, Ponso Gotladera, Jaymar Perez, Arnold Van Opstal and Carl Bryan Cruz are set for their baptism of fire with Gilas Pilipinas in the 2016 Fiba Asia Challenge Cup after being included in the final 12-man lineup by the Samahang Basketbol ng Pilipinas (SBP). SBP executive director Sonny Barrios bared the final lineup submitted to Fiba Asia for the September 9-18 showpiece in Iran, Gilas' first test since the SBP bared plans to revert to the cadets program due to a new Fiba qualifying format that put in doubt the continued participation of PBA players in the national team. The lineup is led by Gilas cadets mainstays Mac Belo, Mike Tolomia, Roger Pogoy, Russel Escoto, Kevin Ferrer and Von Pessumal but also included a lot of new faces following the decision of amateur stars Kiefer Ravena, Rayray Parks and Jio Jalalon to skip the Iran tournament for varying reasons. Blackwater reserve Arnold Vosotros and Jonathan Grey, earlier named to the 14-man team, were listed as alternates who will join Gilas in the trip. At 6-9, Van Opstal now stands as the tallest in the young team which also added some ceiling with the drafting of former Ateneo big man Gotladera, former Far Eastern University standout Cruz and Javier, who until recently manned the paint for the University of the East. On the other hand, Daquioag and Perez are set to shore up a backcourt that had been left wanting in depth after Ravena, Jalalon and Parks pulled out of consideration one after the other. Perez, whose eligibility had to be cleared with Fiba at the last minute, was in fact converted from two-guard to point guard to back up Tolomia in the playmaking position. Pogoy and Pessumal are considered the team's top threats from the outside, with help from Ferrer.